Ready to create a gorgeous, bright-eyed look that appears effortless? 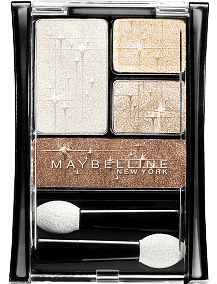 Try NEW Expert Wear Luminous Lights Eyeshadow in Gold Lights for a bright, glowing eye look. The Luminous Lights shades are perfect for everyday wear, but shimmering luminosity makes them more exciting than ordinary neutral shades. Apply the BASE shade first, from lash line to brow bone. Next, sweep on the LID shade, stopping at the crease. Add depth by applying the CREASE shade to the crease of your eyelids. Finally, apply the LINER shade along your lash line. For the best results, remember to blend well as you apply each shade. Your Luminous Lights shadow compact contains a liner shade, so you can choose to keep eyes soft by skipping Step 2, or add drama to your look with Eye Studio Master Drama Cream Pencil Eyeliner. Try Bold Brown for everyday or put on a thicker line of Midnight Master for a more intense, night-ready look. Start at the inner corner of upper lid, moving outward, and extend the line just past the outer corner. Start the lower line at the outer corner and move inward so lines meet at the inner corner of the eye. Find the lash look you want with three different Great Lash options. For big, look-at-me lashes, go with the biggest brush, from Great Lash BIG Mascara. For a look that shows off all of your lashes, try Great Lash Lots of Lashes Mascara. (The unique, heart-shaped Little Grabber Brush gets to even those tiny, hard to reach corner lashes!) For an everyday lash look, choose the trusted original, Great Lash Mascara. Sweep brush from lash roots to tips. Continue adding layers until your desired volume is achieved. Do not let dry between coats. Try NEW Color Sensational High Shine Lip Gloss in Glisten Up Pink for flawless shine and the perfect pop of pink. A dash of pink gloss looks great on almost any complexion and is a fabulous finishing touch to complete your look. Use the wand to apply gloss, starting in the center of your upper lip. Glide wand toward the outer corners, following the contour of your mouth. Finish by sweeping wand across the entire bottom lip.